The Henry Dunant Medal, the highest distinction that the International Movement of the Red Cross and Red Crescent can bestow on an individual, was awarded to Professor Michael Bothe of the German Red Cross, and Mr Arthur Agany Poole of the South Sudan Red Cross, at a special award ceremony on 9 November 2017, in Antalya. Standing Commission Chair Mr George Weber praised Professor Bothe, a leading figure in International Humanitarian Law, for his exceptional commitment and immense contribution to developing and strengthening international humanitarian law and promoting the Movement’s Fundamental Principles throughout his life. Introducing the second winner Mr Arthur Agany Poole, Mr Weber told delegates how “Uncle Arthur” had volunteered for the Sudanese Red Crescent and later the South Sudan Red Cross between the 1950s and his retirement in 2014. He embodies the humanitarian spirit and is an inspiration to the younger generation following in his footsteps. Professor Michael Bothe has long been recognized as a leading figure in the field of international humanitarian law. 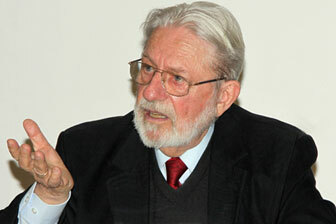 Since the 1970s he has been closely associated with the work of the International Red Cross and Red Crescent Movement. In 1974, after many years of distinguished academic study and independent research on comparative public law and international law, he received his habilitation or post-doctoral research qualification. At the same time, he became a member of the German government’s delegation to the Diplomatic Conference on the Reaffirmation and Development of International Humanitarian Law Applicable in Armed Conflicts (during its four sessions, from 1974 to 1977), which drafted and adopted the first two Protocols additional to the Geneva Conventions. The extraordinary achievement of adopting the two Additional Protocols was in no small part thanks to him. Professor Bothe’s pivotal role in the Conference also helped to pave the way for the current deliberations on an enhanced regime for persons in detention. In addition to teaching law in many leading universities, for over four decades Professor Bothe has been an active participant in the German Committee on International Humanitarian Law and has thus contributed immensely to the advancement of the Movement’s work in this area. He chaired the Committee from 1991 until 2014. He has also been special adviser to the Presidential Board of the German Red Cross. The numerous expert articles and books that he has written provide a wealth of knowledge on both law and the Movement, and are invaluable reference to draw on when it comes to improving compliance with international humanitarian law. Professor Bothe has been duly lauded as a meticulous and immensely knowledgeable scholar. His great capacity to listen to opinions from all sides has underpinned his achievements in negotiating greater protection for victims of conflict and stems from his deep sense of humanity, which has been the inspiration of his extensive involvement in the Movement’s activities. Professor Bothe is recognized not only as an expert in international humanitarian law, but also as someone who generously gives of his time to engage in academic exchanges with others and demonstrates a genuine interest in helping younger scholars. In recent years, alongside his active involvement in various expert and advisory groups, Professor Bothe has devoted himself to the promotion of humanitarian protection, and has been conducting research on conflict and peace. Throughout his life, he has shown exceptional commitment to developing and strengthening international humanitarian law and promoting the Movement’s Fundamental Principles. He has therefore made an immense contribution to the political, operational and academic debate on international humanitarian law as well as building consensus in the Movement and the wider political arena. 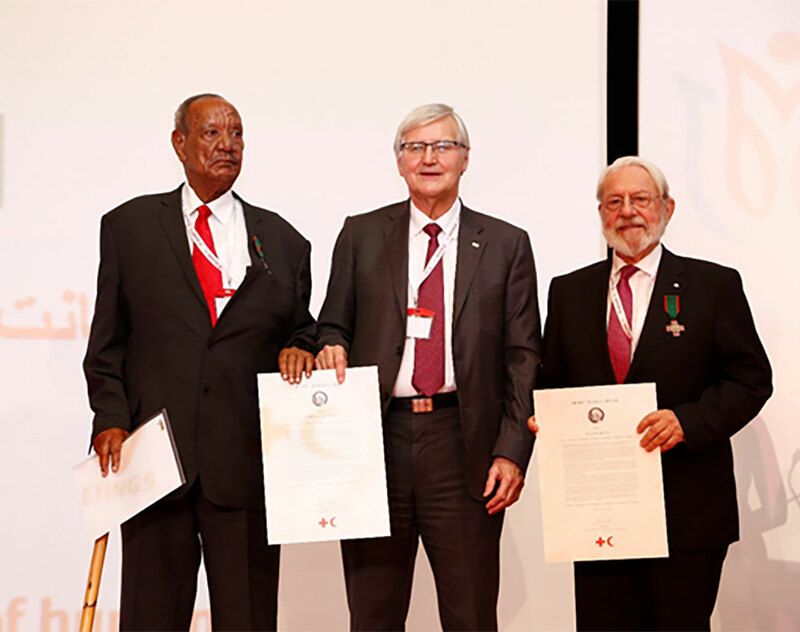 For his commitment and contribution to the development and promotion of the Movement’s Fundamental Principles and ideals, the Standing Commission of the Red Cross and Red Crescent has unanimously agreed to award the Henry Dunant Medal – the Movement’s highest distinction – to Michael Bothe. Arthur Agany Poole has dedicated his life to helping people in need of assistance. To those who have worked with him, he is simply “Uncle Arthur”. But for the International Red Cross and Red Crescent Movement, he is a living legend. After Sudan gained its independence in the 1950s, Mr Poole decided – against his father’s wishes – to serve his country as a humanitarian rather than travel to England to continue his studies. He started out as a Red Crescent volunteer and, in a career spanning decades, became one of its most trusted staff members. He proved to be a reliable friend and esteemed partner within the Movement. 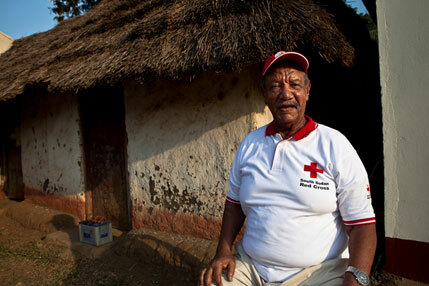 In the 1970s, Mr Poole helped what was then the League of Red Cross Societies to establish offices in southern Sudan. He later helped the ICRC to open offices in Wau, in West Bahr El Ghazal. He was also highly instrumental in establishing branches of the Sudanese Red Crescent Society in what is now South Sudan. Throughout the long and brutal conflict in his country, he remained committed to alleviating human suffering, and was deeply involved in the Movement’s operations to respond to the crisis. His remarkable negotiating skills led to the release of the ICRC delegates who had been taken captive in 1996 in Wunrock. One of Mr Poole’s legacies is the pivotal part he played in mobilizing huge numbers of volunteers across South Sudan. Thanks to his exceptional interpersonal skills, he built up a network of contacts among the authorities in Sudan and South Sudan. Mr Poole’s strong leadership skills, and his ability to build bridges between people of differing views, have been appreciated by one and all. Just recently, he received a certificate of recognition from both the Sudanese Red Crescent and the South Sudan Red Cross Society. By the time he retired in 2014, Mr Poole had distinguished himself through his voluntary work and wholehearted commitment to the humanitarian cause. Not only did he give selflessly of his time and energy, but he also financed his own travels around the country – often to the most dangerous places – in order to provide life‑saving assistance. Mr Poole embodies the Movement’s humanitarian spirit, and is an inspiration to the younger generation following in his footsteps. For his commitment and contribution to the development and promotion of the Movement’s Fundamental Principles and ideals, the Standing Commission of the Red Cross and Red Crescent has unanimously agreed to award the Henry Dunant Medal – the Movement’s highest distinction – to Arthur Agany Poole.